I’m fairly certain there are masses of The Verve Pipe fans feeling a little bitter that lead singer Brian Vander Ark and his band no longer pump out angst-ridden anthems such as their hit, The Freshman. There will also be masses of fans turning away from their computers in disgust when I say the teenagers’ loss is the little kids’ gain. Yes, The Verve Pipe have gone kindie. A Family Album roughly reflects the rhythms of a child’s day. It starts with Wake Up, a boppy, melodic tune with a slight bluegrass twang. I’ll be completely honest and say that I think Wake Up is the weakest track on what is a brilliant kids album – the lyrics are a little obvious and in no way reflect what’s in store as you listen on. Never judge an album by the first track! The bluesy, slinky We Had to Go Home is fabulous – funny, catchy and about an issue close to lots of kids’ hearts, misbehaviour at a party and having to leave when the real fun starts (or, according to the parents, when things start to get out of hand). Anything you own is a microphone…. When One Became Two is a sweet little song about a growing family, complete with hippy flute melodies, Partridge Family-style harmonies and a live bassoon (not found on many albums these days!). This song does nothing to prepare you for what comes next – the album’s second stand-out track, Cereal. This anthem to breakfast food rocks in a show-stopping kind of way. I also love Worrisome One, simply because I have a little worrier in my brood. The lyrics examine fear of the unknown, gently suggesting that the “little man of steel” relaxes and has fun. Like all good children’s albums, this one finishes with a lullaby, Go to Sleep. Unlike other lullabies, Go to Sleep features a French horn, another instrument rarely included in children’s music. The result is mellow, calm and a fitting end to a fantastic album. 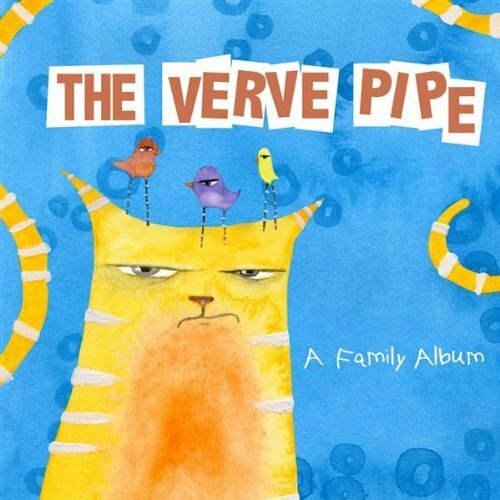 A Family Album is available directly from The Verve Pipe for US$13. Helpfully, you can listen to every track on the band’s website at no charge.